Game developer and publisher IGG (I Got Games) has released Galaxy Online 3 on Android devices. The game is the third title in the traditionally browser-based series, and places players in the role of a commander in the Galactic Federation, challenged with building an outpost on a newly colonized planet, and defending that outpost from enemies as they climb the ranks of the Federation’s High Council. 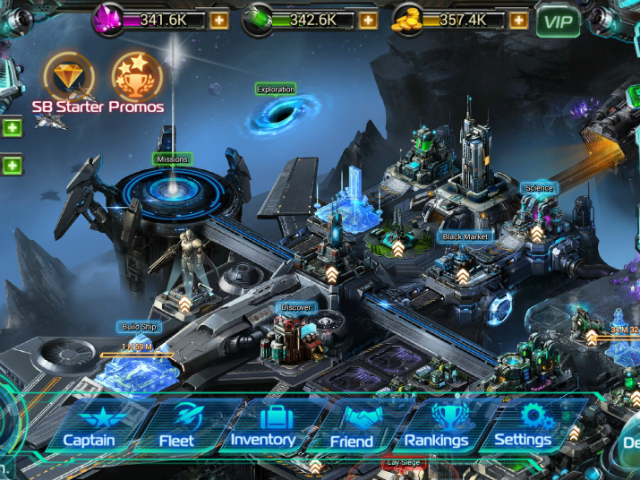 Galaxy Online 3 is a base-building combat title, which sees players building their base by balancing the use of key resources, including gold and metal. These currencies are produced automatically over time, but players can increase their productivity by upgrading the base’s mine and extractor. Users spend their currencies on constructing and upgrading buildings, as well as on the construction of new spaceships for their fleets (among other options). The game’s story mode sees players completing level-based battles, which progress automatically, until one side is defeated. As battles become more challenging, players will need to construct newer and better ships, and hire captains using separate currencies (including the option for premium purchases) to command those ships. While gamers have relative freedom to progress as they see fit, the game does guide players through a general flow of progression via a “task” system. While many tasks focus on building one’s base and completing battles, players must also keep track of their base’s defenses, building cannons and other structures to defend it from attacks by other real players. Social features include these standard player-vs-player battles, as well as weekly championship tournaments, daily league matches and more. Users can also chat with other players via a real-time chat window while on their home base. Galaxy Online 3 is available to download for free on the Google Play store. The game is coming to iOS later this year.